AKW’s very own Paul Tingey recently took part in the ‘Iceland Challange’. 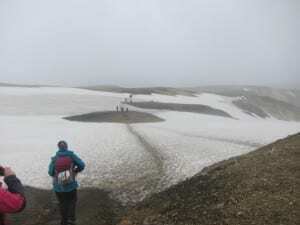 The Iceland Challange is a trek that takes part over two days and covers the equivalent of a marathon a day! Paul had to walk through sun, rain, wind, ash, snow, ice and over rocks. The trek starting at 6-7AM each day, walking up to 10 hours a day just to achieve the target distance of a 26 miles a day. Paul and everyone at AKW are proud to say that over £2100 was raised for ‘Help for Heroes’. Paul ascended and descended hills up to 2200ft high over the rugged terrain. According to Icelandic guides, the trek is meant to be completed in 4 days. Completing this in half the time did cause issues, multiple people were pulled out of the trial for their own good and safety. “The trial has vastly differing scenery to view along the route, though seemed to be never ending at times, which was then aided by energy gels, snacks and Haribo’s. The nights having no darkness and sleeping in tents lying on lava rock between the individual day treks were not pleasant, but all in all was worthwhile” Paul told us. Here at AKW we are extremely proud to have such a giving team. We are all very proud of Paul and his massive accomplishment!